Two appetizers in one! 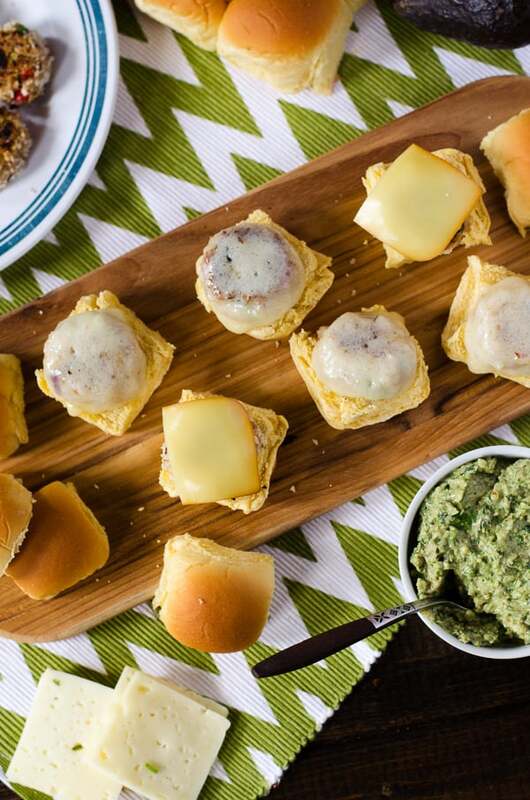 Spicy tuna croquettes transformed into fun mini sliders, topped with melty cheese and homemade avocado pesto. One of man’s greatest food inventions has to be meat in a can. You know, for those times when you need a quick, convenient protein source, but are too lazy to cook up a filet or steak. 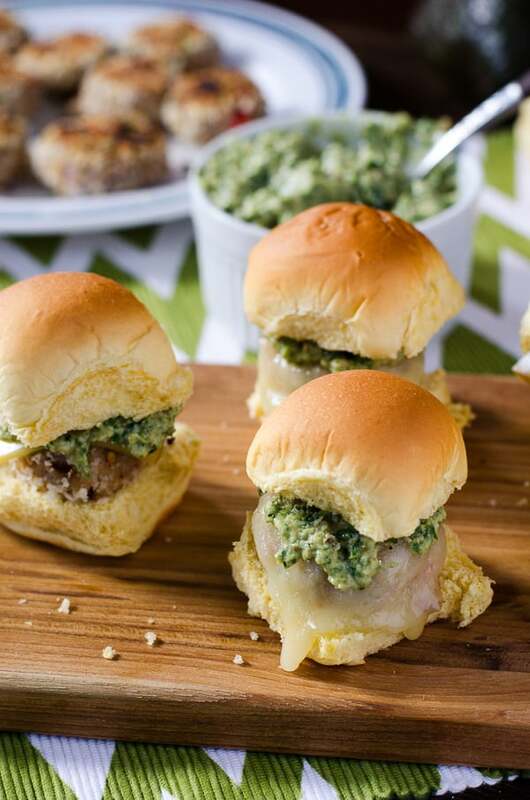 Instead of firing up beef sliders for the Big Game, why not try something a little different and mix up the menu – Spicy Tuna Croquette Sliders with Chunky Avocado Pesto! I grew up eating lots and lots of canned tuna. It was, of course, by choice. Nana would often ask what I wanted for lunch, and along with sandwiches and tuna & noodles, my absolute favorite tuna recipe was tuna patties or croquettes. I just loved the mishmash of tuna, her homemade bread crumbs, and fresh eggs. She was a big believer in salt and pepper, and nothing else in the way of seasoning, but they always came out of the frying pan perfect, and she always paired them with overly salted crinkle fries that I could never get enough of. I loved them, but Nana’s variation was, admittedly, simpler and not as flavorful as these spicy little guys. I took her basic recipe and added a buuuuunch of stuff she never would have imagined putting inside of them. 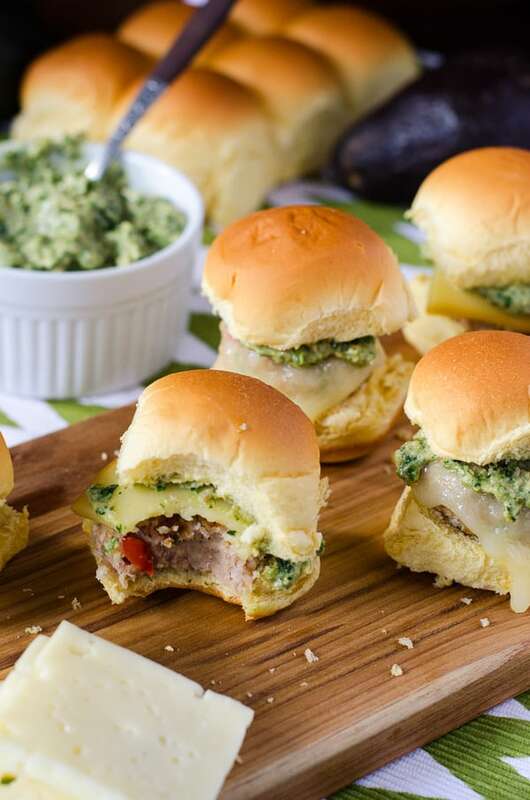 Then I plopped them all on the most adorable slider buns I could find and melted some gooey cheese on top before slapping on big dollops of homemade avocado pesto. …I could eat it on everything forever and never get tired of it. I added the walnuts in after it was mostly pureed, so it retained just enough lovely chunks to satisfy my love of textures. I highly recommend it, but if you prefer smooth pesto, blend away. 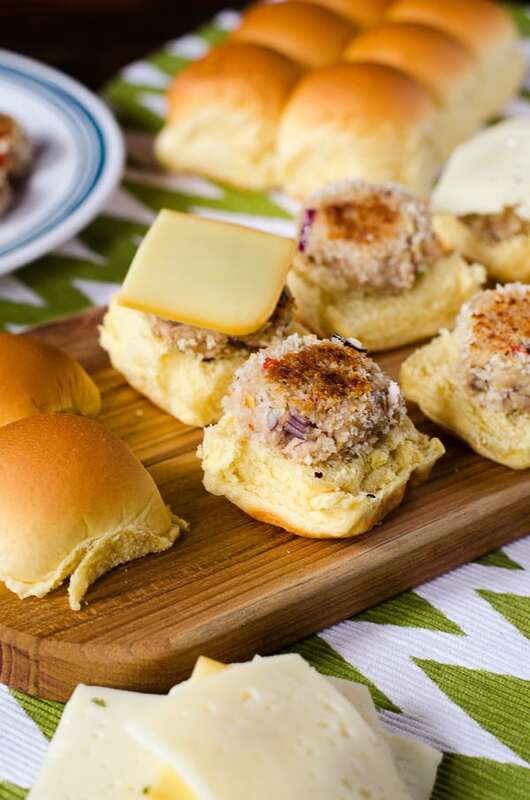 So go forth and feed your football fans these fun, spicy sliders! And save some pesto to dip your chips in – you’ll be obsessed. Whisk the eggs and lime juice together in a large bowl, then stir in the bread crumbs to form a paste. Add tuna, onions, peppers, celery, garlic, cilantro, salt, and peppers bowl and stir to combine. Divide the mixture into 24 1-inch balls, setting them on a parchment lined baking sheet. Place the remaining bread crumbs into a shallow bowl. Coat each croquette in the panko, then refrigerate for 15 minutes. Flatten the balls slightly with the palm of your hand. Heat 1/4-inch of olive oil in the bottom of a 12-inch saute pan set over medium heat. Add the croquettes (I was able to cook 1/3 of them at once) and cook 2 to 3 minutes on each side, or until golden brown. Remove to baking sheet lined with paper towels, and allow to cool slightly. Slice slider rolls horizontally, placing bottom halves on the foil-lined sheet and setting top halves to the side in their own square of foil. Set a croquette on each roll bottom, then top with a square of cheese. Place them in the oven, along with the tops, and bake for 4-6 minutes until buns are toasted and cheese is melted. 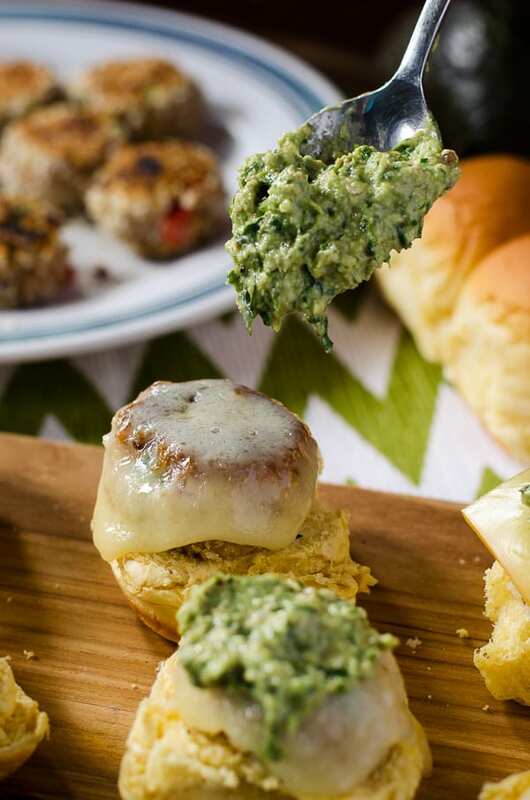 Remove from oven, cool slightly, top each slider with about a teaspoon of Chunky Avocado Pesto, and replace bun tops. Serve with overly salted fries and enjoy! In a food processor or high-powered blender, combine arugula, cilantro, avocado, garlic, lime juice, and half of the walnuts. Pulse until chopped and blended, then add the walnuts and pulse again, drizzling in olive oil to form a chunky paste. Season with salt & pepper to taste. Refrigerate remaining pesto for up to 5 days by covering it tightly with plastic wrap to prevent browning. If tuna’s not your thing, I bet you’ll still find the perfect Gameday recipe to share in this awesome list featuring my fellow #SundaySupper cooks! 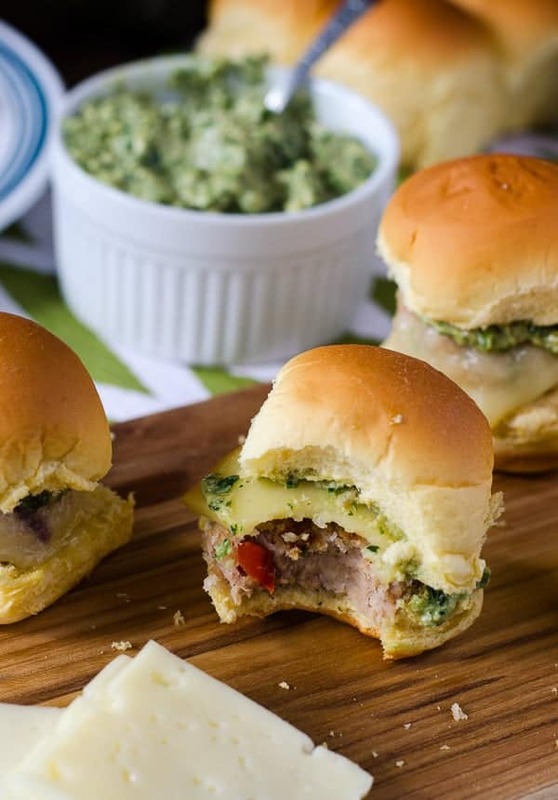 These are a great alternative to the usual beef sliders you see, I love it!! 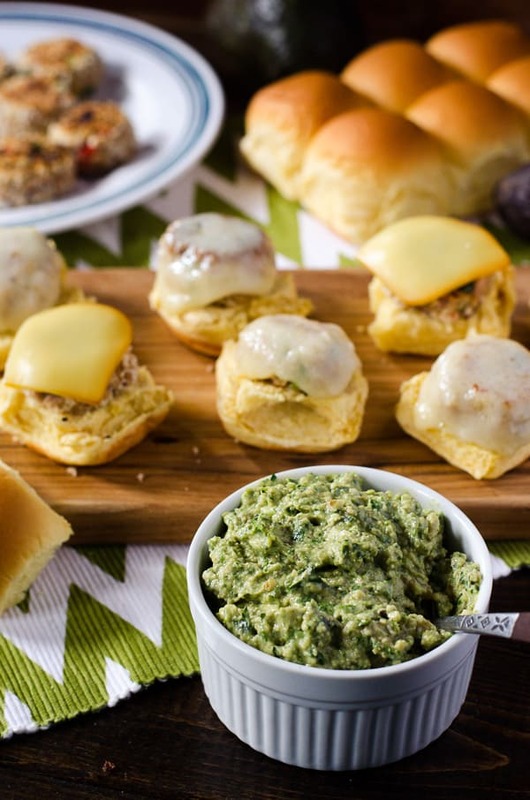 These sound delicious – I love tuna, and the avocado pesto sounds great as well! 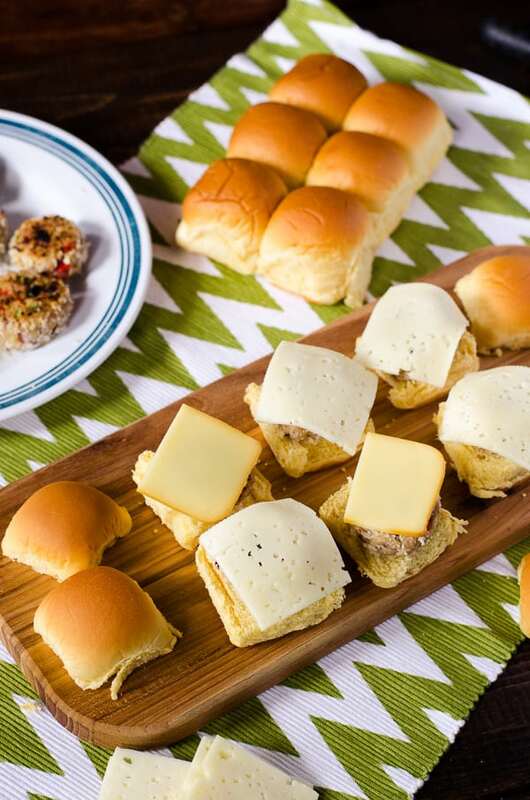 These are awesome looking, and certainly a step up for sliders! Love them! I’d just be happy with the croquette, but love that you took it above and beyond into slider land. Now this is an upscale tuna sandwich! Yum!